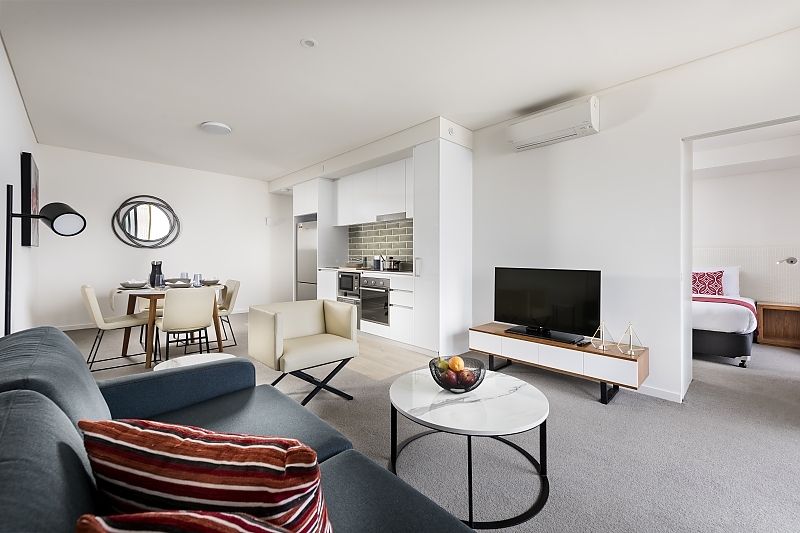 Space to relax and feel at home in our One bedroom apartment offering you separate living area. 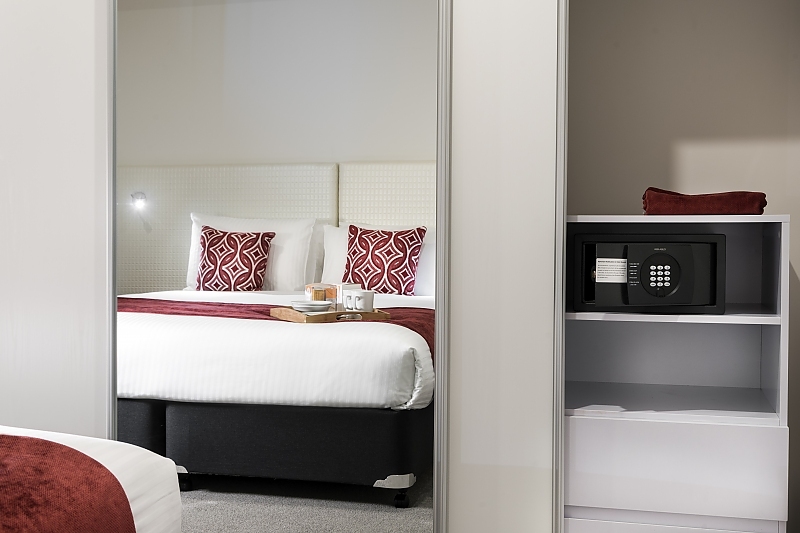 Each room is designed with space and comfort in mind so you can relax, sleep and work during your stay, perfect for business or leisure travellers. Furnishings are contemporary with floor to ceiling windows allowing lots of natural light to stream through. 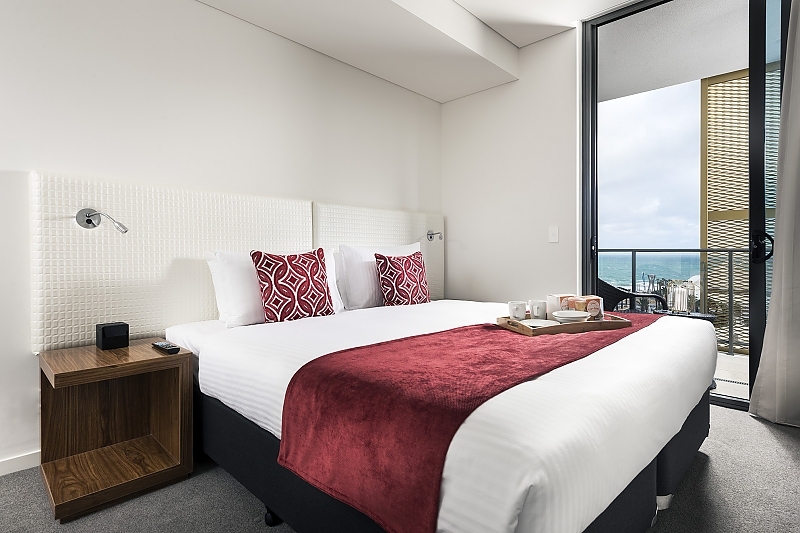 Let the outside in  All rooms include individual controlled heating/air conditioning, kitchenette complete with full cooking facilities and dishwasher, Full laundry facilities and bathroom including local amenities, 43 Smart TV with 500MB internet access & 32 TV in master bedroom. All Apartments are fitted with our go anywhere Handy Phones includes data, international and local calls complimentary. Apartments offer separate living and outdoor entertaining area for that home away form home feeling. 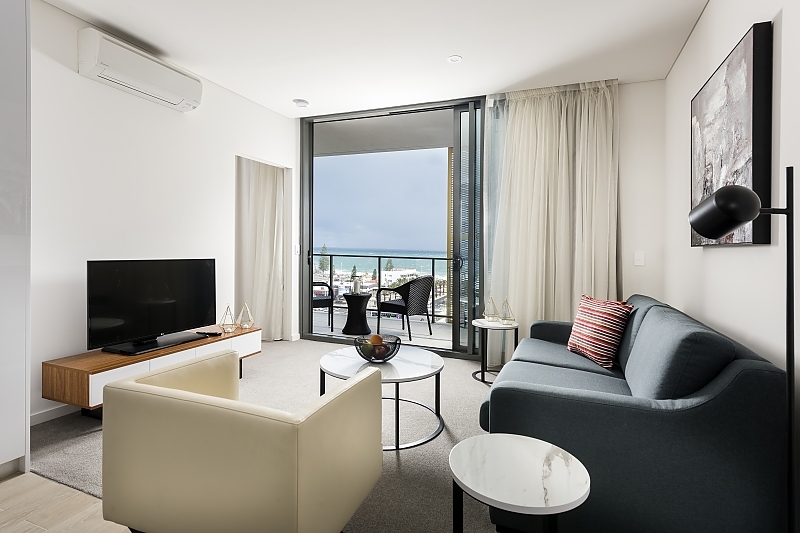 Please also note that not all of our 1 bedroom business apartments have ocean views as per the images shown. 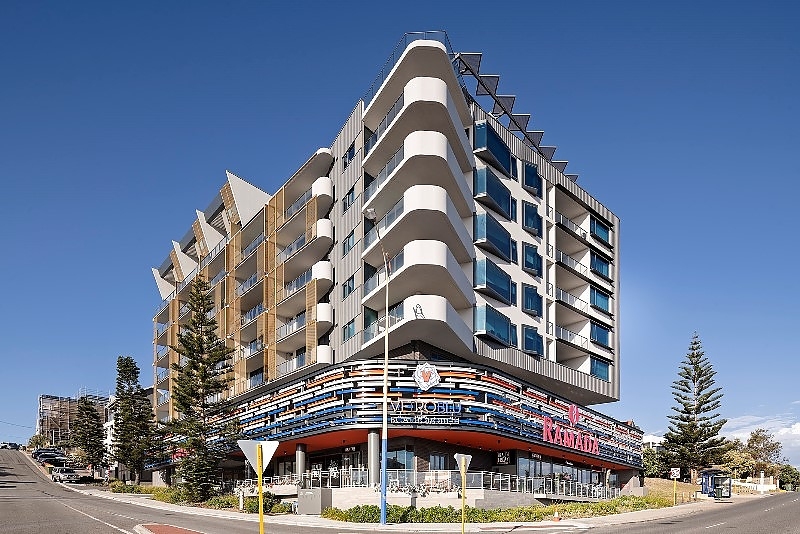 Some of our 1 bedroom business apartments are on the Eastern side of the building and can not accommodate ocean facing views. Guest Service is open from 7am till 11 pm daily. 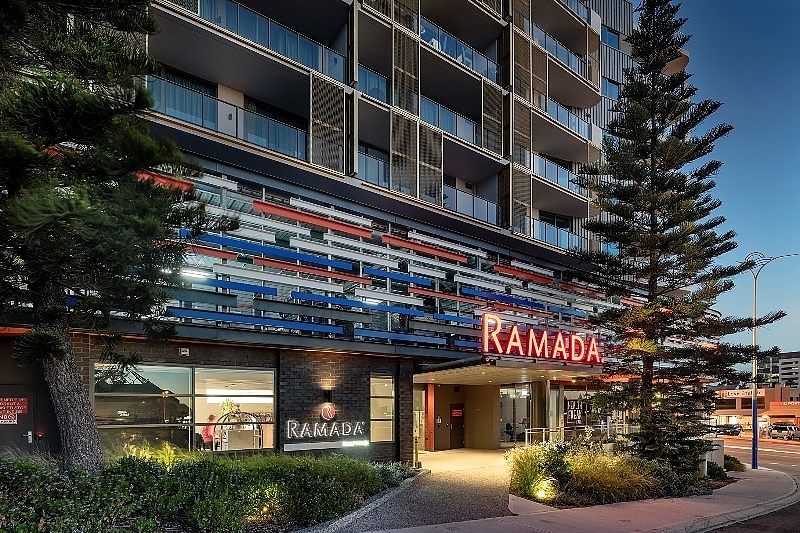 Ramada Vetroblu Scarborough Beach is the latest addition of serviced apartments in the Scarborough precinct, with sweeping views of Scarborough and Perth’s iconic sunsets. 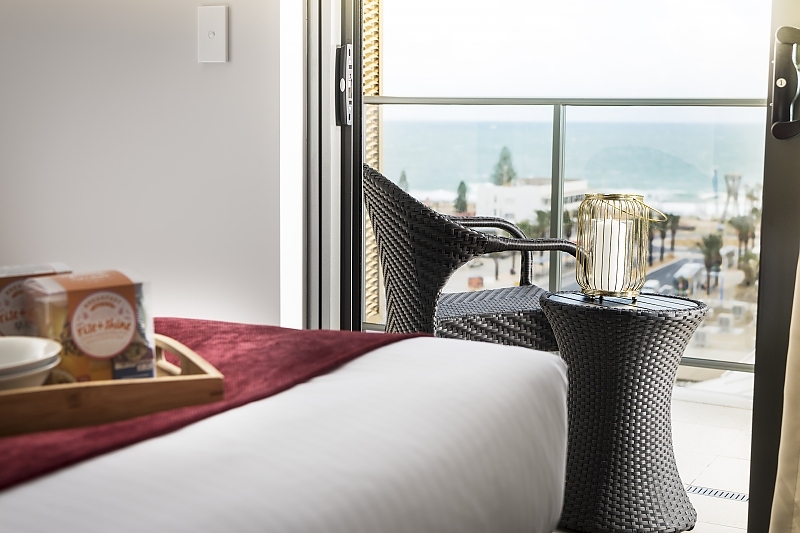 If you are wanting a break away from the hustle and bustle – everything is at your doorstep in Scarborough –You can swim, surf, fish, people-watch, skate, cycle, sail, windsurf, snorkelling, kitesurf, shop, dine, get fit, explore, or relax and sun bake. You can even access free WiFi on the main beach, foreshore areas and amphitheatre. 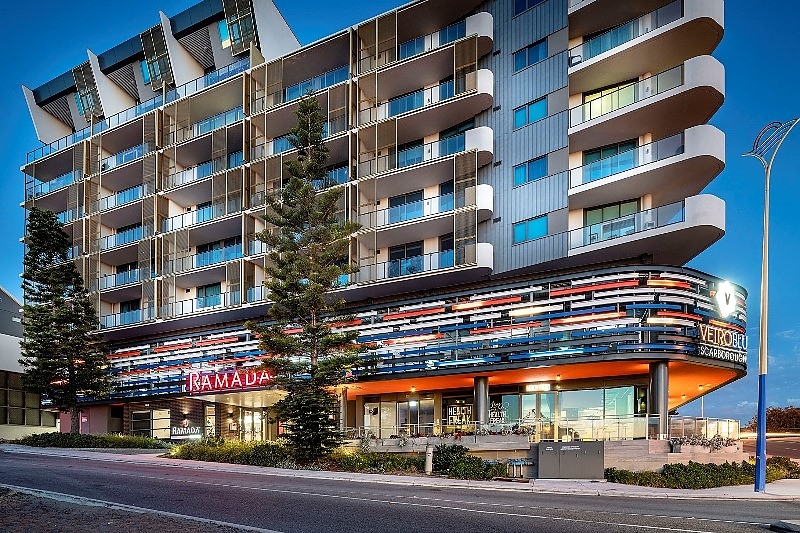 Centrally located within a short drive from Perth CBD, Hillary’s and Fremantle to the South. 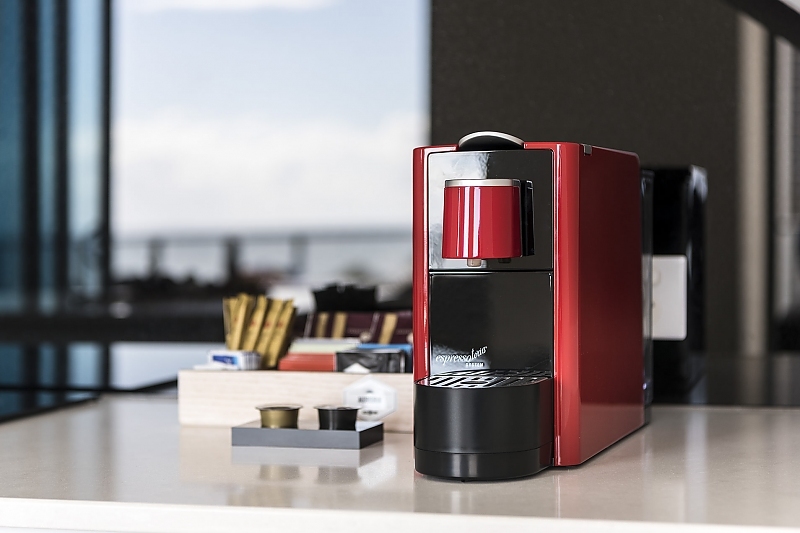 We put you where you need to be without compromising on lifestyle. Offering One Two and Three Bedroom Apartments. 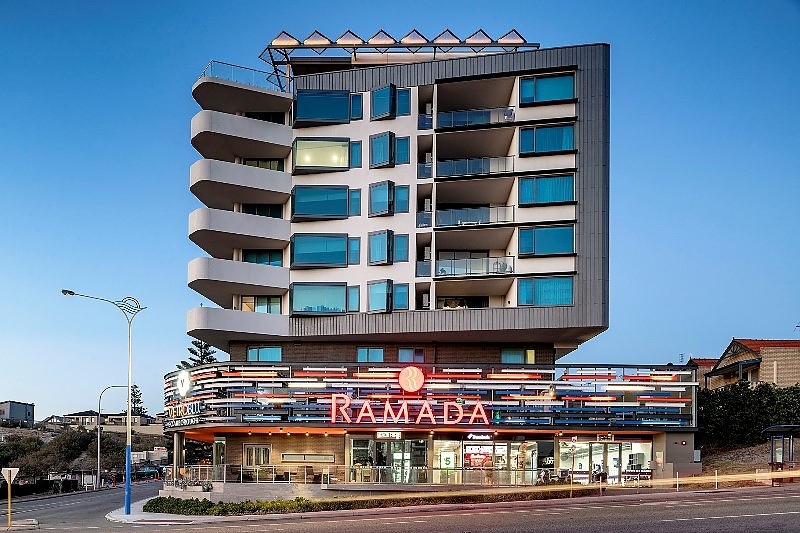 Ramada VetroBlu also have three and four-bedroom split level penthouse apartments offering full 180 Views. 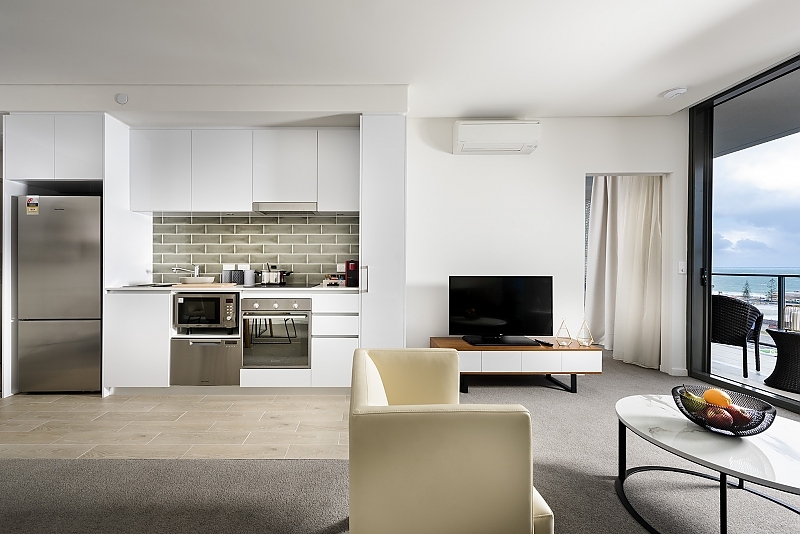 Let the outside in – All rooms include individual controlled heating/air conditioning, kitchen complete with full cooking facilities and dishwasher, Full in room laundry facilities and bathroom including local amenities, 43’’ Smart TV with 500MB internet access & 32” TV in master bedroom. Go anywhere handy phones offering free local and international calls and go anywhere data. 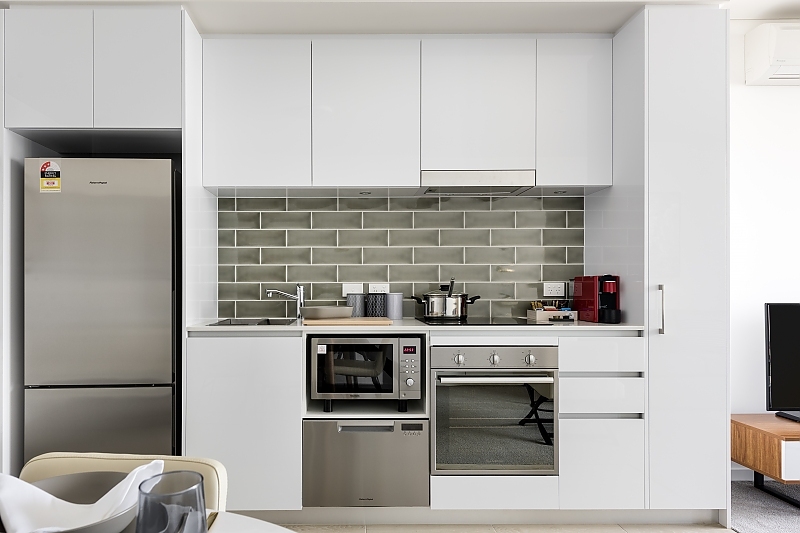 Apartments offer separate living and outdoor entertaining area for that home away form home feeling. 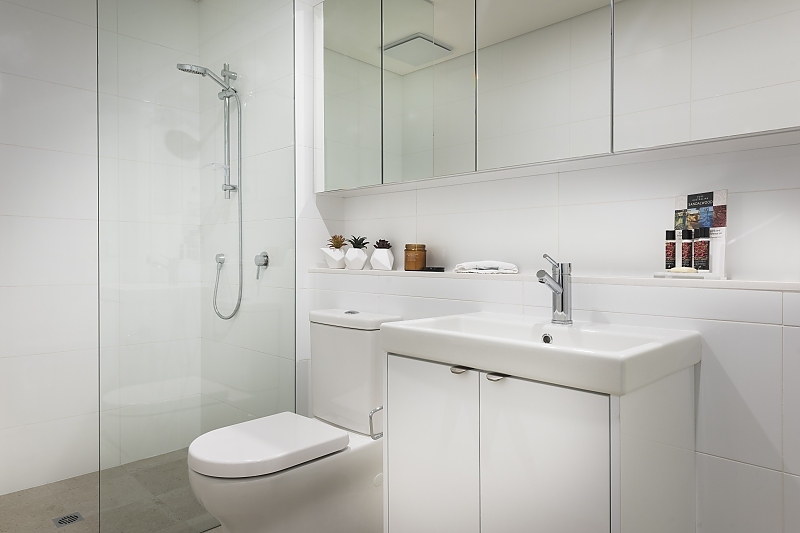 Give youself space to relax and feel at home in our apartments. 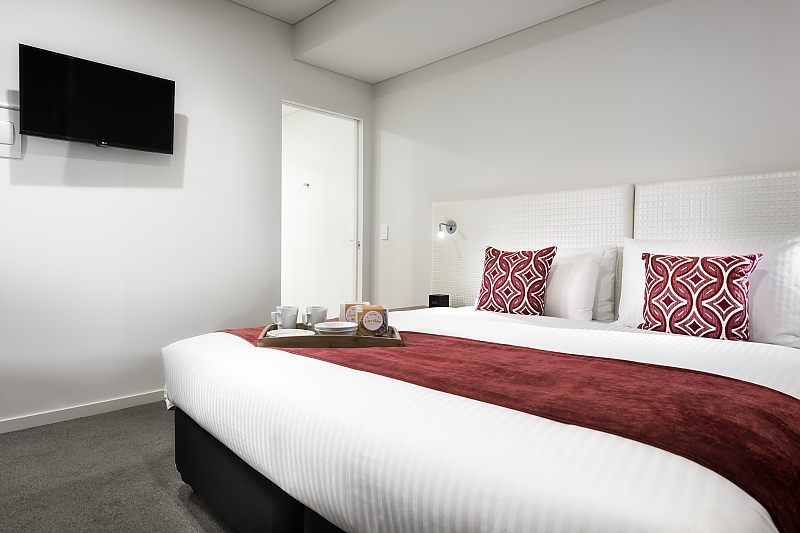 Each room is designed with space and comfort in mind so you can relax, sleep and work during your stay, perfect for business or leisure travellers. Reception hours: Other Guest Service is open from 7am till 11 pm daily.